During the 9th of November, 2012, Filipino student challengers stepped up to the 24-hour Windows 8 App Development Challenge and gathered at Microsoft Philippines to celebrate the availability of Windows 8 for WOWZAPP 2012, a worldwide hackathon for Windows. 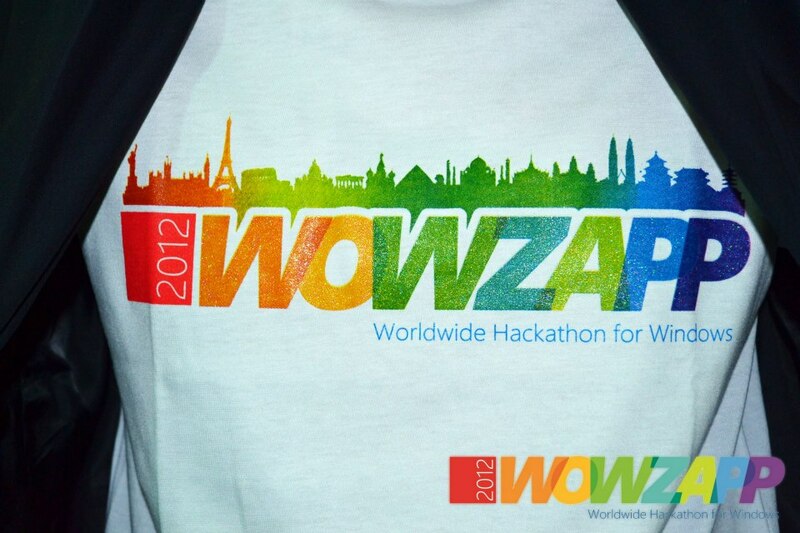 WOWZAPP 2012 is a worldwide event happening simultaneously in over 30 locations around the globe where students are expected to work in teams. Their goal is to create apps for download in the Windows Store. During the entire event, students had the opportunity to not just work with their respective teams, but also with our Microsoft app experts, developers and designers who helped them, assisted them in coding and guided them each step of the way. The event kicked off at 7:00 p.m. Hour zero started with the registration and eat and greet. An hour and a half later, participation went inside the so-called no-sleeping zone or the room where they will be staying to code for the rest of the entire event. The participants were welcomed by Mr. Alvin Gendrano, the Director of Developer and Platform Group of Microsoft Philippines, giving them words of encouragement that they will be needing for the rest of the night. Mr. Joben Rara followed to give a talk regarding the Modern Style UI, and the Windows 8. We also have Mr. Tim Vergel De Dios, the audience marketing manager of Microsoft Philippines to discuss the techniques in creating a great Windows 8 app. And then, during the 4th hour, the teams started to build their apps by means of project planning. And afterwards, the teams have finally started working with their apps. While working with their apps, at exactly 3 o’clock in the morning, an unexpected event happened. Microsoft Philippines was attacked by zombies. You heard it right, the WOWZAPP 2012 participants were attacked by zombies. The zombies came over to keep the coding spirit of the participants, alive (Aside from their main intention of getting their brains). To break the ice, the zombies are in the search for some participants who would want to dance with them to the tune of the worldwide hit dance craze – Gangnam Style by Psy. And our WOWZAPP 2012: Manila participants are active enough to be part of this ice-breaker game. 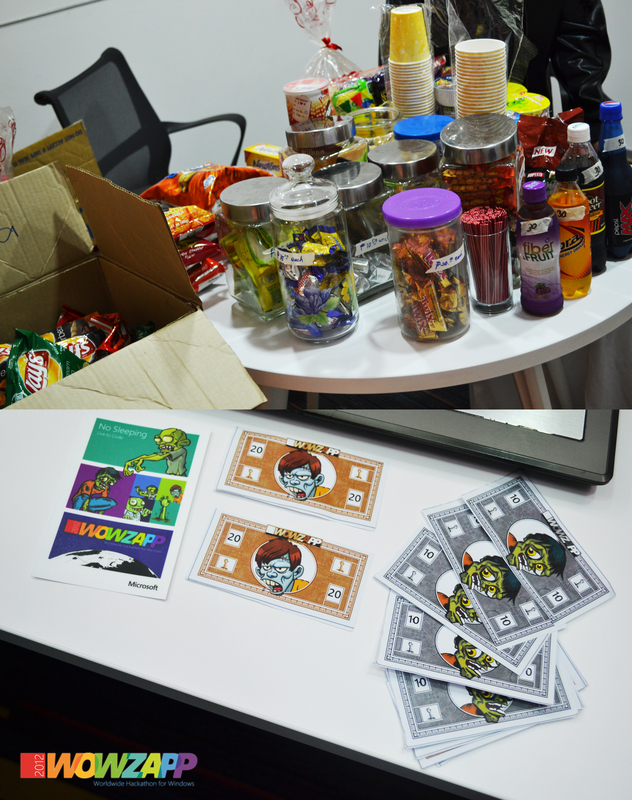 As a part of their participation, they received some goodies from the zombies themselves. While working for their apps, participants can go to the nearby store within Microsoft Philippines where they can purchase brain and tummy boosters using their Zomonies. The participants continue to work with their apps straight up until in the morning and they stopped for a while for breakfast by 07:00 am. Finalizations with their apps came right afterwards up until 3:00 in the afternoon. App consultation were held from time to time through the help of our Microsoft app development experts in the house. With 80% accomplished, critics decided to scout around to look for the apps with the best looking Live Tile. The winners were announced by 12:00NN. We have the apps Whacked and Pic-A Number. The team winners for the award received Windows 8 Developer Jacket. With only two hours left, the teams decided to finally introduce their apps. Presentation time was held at 5 o’clock in the afternoon. This is the most crucial part of the WOWZAPP 2012: Manila because this is the point where the best team with the best app be awarded. And so, the presentation phase has begun. After the presentations, the certificates of participation were given to the students who took part to the success of WOWZAPP 2012: Manila. And then, it was followed by the announcement of the ultimate winner. The best team for WOWZAPP 2012: Manila will receive a dinner to Makati Shangri-La, One Microsoft Tablet, Movie Tickets and Microsoft premium items for the entire team. And the team who were awarded as the best team for WOWZAPP 2012 was the team from De La Salle University comprised of MSP Juniors. They created two apps during the entire length of the 24 hour challenge. Indeed, it was a tough, fun and challenging experience to everyone who participated at the WOWZAPP 2012: Manila. Staying up for 24 hours straight, coding and thinking about their prospect apps isn’t an easy job. It was indeed historical one since Filipino students just proved that Filipinos can also step up for App Development and can create download-worthy apps. Congratulations and Kudos to everyone! Thank you for participating, Till then!